NOTE: As our REPORT continues to evolve and improve over time, the format may appear different than the 2014 “sample” REPORT that is presented here. GOAL: Eliminate the noise & nonsense and concentrate on the RELATIVE STRENGTH & TRENDS of assets and data! CLARITY/MACRO: U.S. stocks are strong and leading in relative strength. If holding Developed Market stocks, they must be hedged into U.S. Dollars. CLARITY/MACRO: We expect floating-rate to very soon take over relative strength leadership from fixed-rate and for fixed-rate instruments to eventually become dangerous as rates rise (and they will rise). Expected first Fed interest-rate increase is December of 2015. CLARITY/MACRO: Commodities are in bad shape and getting worse… strong upward rallies, especially in oil, will be parabolic and short lived. The rising $US and the potential for rising interest rates in the U.S. are global drags on commodity prices. Gold normally leads the direction of oil by many months, so oil may show a further drop into the New Year. For whatever it’s worth, WTI-crude prices have very long term support at $25ish (currently at $75). China, India, Japan and Europe (and some others) are benefited by falling oil prices… Russia, Norway, Venezuela and Canada are harmed by falling oil prices. A full 70% of Russia’s economy is dependent on strong oil prices and its consumers do not benefit much from falling prices, so it is a lose/lose situation for them. Russia’s energy sector is closely intertwined with its already fragile banking system. CLARITY/MACRO: The U.S. leads in relative strength over everything else. Please remember that we are positioning based on a long term view and some signals may trigger early and therefore seem incorrect. Short term gyrations should just be patiently tolerated; fearless patience (and limiting any mistakes to small ones) is what separates the best traders from the worst. Conditions in the United States have a strong influence on other countries, so U.S. data is of supreme importance. NOTE ON TRADING: All asset purchases should always be either “limit” orders or “stop-limit” orders because of the sometimes wide spread between ask & bid. The best fill times for ETFs are between 10:30 AM and 3:30 PM, U.S. EST as this is when spreads are narrower; the open should always be avoided unless using automatic “stop-limit” orders. Risk-adjusted returns; lower returns in exchange for less risk. They want to know that their Advisor has a method for determining high-risk periods and bear markets and that their portfolio will be adjusted accordingly. They want shallower draw-downs in exchange for lower returns. 67% of clients are satisfied with annual returns of between 4% & 6% and only 6% seek gains over 10% per year. They want diversified assets in their portfolios that are un-correlated and they do not want a 100% stock only portfolio. What this means is that clients want risk-adjusted returns and it is only the Advisor who believes that it is his/her job to beat the S&P-500. The money manager’s job is to make the performance line go from bottom left to upper right. It’s that simple. Once you understand that is your job description, then you have to start protecting the direction of the line. MarketCycle would like to add that when the RISK surrounding the next big bear market hits, investors who have forgotten the lessons of 2000 and 2008 and that are now relying on Robo-Advisors and software programs and “I can do it myself” investing, will once again be seeking professional help with what remains of their money. What is the worst case scenario that Advisors fear most? It is a repeat of the Crash of 1987. MarketCycle would like to remind everyone that this “crash” caused investors to lose only 9 months worth of profits and they made these profits back within the next 13 months. A repeat of this is not the thing to fear. But what is the thing that we should all fear? Our own fears… our innate emotions and cognitive biases that force us to constantly make poor decisions, to do the wrong thing at the wrong time and to have clouded vision! DALBAR reports that individual investors continue to earn ¼ of the annual gains of buy & hold in the S&P-500 because of repeatedly buying high and selling low… and this subpar gain is compared to buy & hold, which is itself a subpar technique. 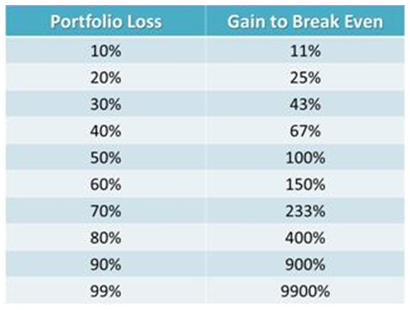 If one’s portfolio gains 15% per year for three consecutive years and then loses 15% in the fourth year, then the total return for the four year period would be only slightly higher than 6% per year. It is extremely important to avoid losses over the longer-term. Individual stock picking is also problematic. 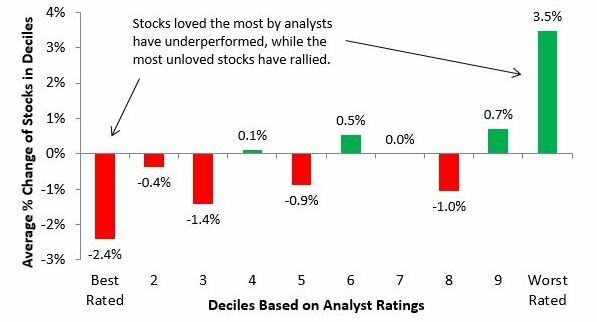 93% of professional stock traders believe that they are better than average (which is impossible) and yet only (a rotating) 4% beat the S&P-500 each year; the professional stock analysts that traders get their “stock-picking” information from have an extremely low accuracy rate. 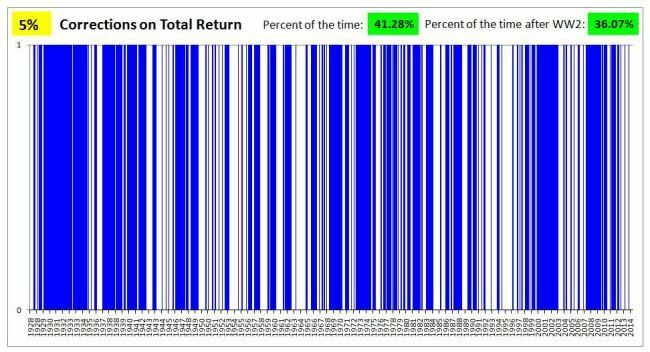 On any given day, tens of millions of traders are buying and selling the same 4000 U.S. stocks… back and forth, back and forth and back and forth. Millions of these traders are attempting to beat Warren Buffett by placing lines and squiggles on a price chart. 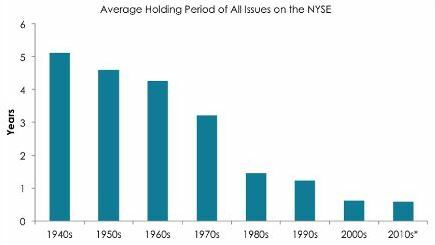 A long-term holding of a diversified ETF portfolio (containing trending assets) may be the best choice for the 96%. The fact that “reversion toward the mean” is forever and always in force tells us that one should avoid any outperforming esoteric ETFs and mutual funds because they will soon be laggards. 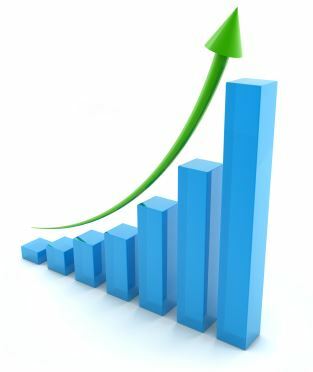 (The majority of actively managed 5-STAR rated mutual funds are able to hold that top rating for 12 months and are subsequently rated 1-STAR within 5 years. Mutual funds normally have dramatically higher fees and taxes than do ETFs.) Importantly, now that the “dumb money” has control of the markets via ETFs that they can jump in and out of, long-term holding periods should continue to outperform, offering patient investors a type of time arbitrage. REFERRALS: When an existing member refers a colleague that goes on to become a new fully paid member (after their free trial period), then the referring member will be mailed a check in the equivalent amount as one month of membership (at your membership level). It is a win-win for all involved.